Our Most Popular Moab Adventure! Rafting the Colorado – Awesome!!! My son and I booked an afternoon rafting trip on July 30, 2010. Neither of us had gone rafting before so did not know what to expect. From beginning to end the experience was unforgettable. Our guide Maddy was awesome and made our trip a lot of fun. I would recommend doing the afternoon trip to everyone just so you can have lunch at the at Red Cliff Lodge. The food was really good and it was a nice break. The views going down the Colorado River were extraordinary and the water was very refreshing. My only regret is that we didn’t have the time to do an all day trip. Thank you for a wonderful experience. I look forward to doing it again. Helpfulness of reservation staff far exceeded expectations. 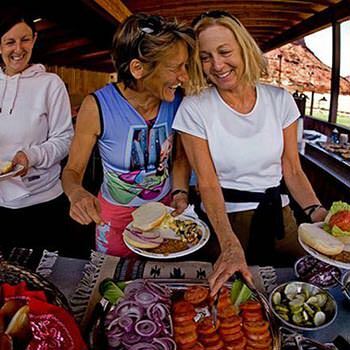 The Moab Adventure Center went above and beyond to accommodate our needs. Taylor was amazing – friendly, very competent, and very patient with our slacker crew – they didn't paddle as hard as he did. Wind made it a real challenge in area where current was not as swift, but he handled everything well. Lots of fun! Looking for more challenging run on our next visit. Might leave the slackers at the cabin next time. Meish was a great guide on the Colorado River PM Half Day Rafting Trip. He knew so much about the history of the area. He made sure to learn a little bit about each of us in the raft and kept us engaged in conversation as well as entertained. My family and I look forward to another visit to Moab. Sharon, who I spoke to on the phone to make my reservation for the Colorado River PM Half Day Trip, was very clear and kind and helpful as I made my reservation the same day as our trip! Our guide, Chris was AWESOME. He made us all comfortable and kept us very entertained when the water was so calm. We loved the energy and the pace of this whole trip. Lunch far exceeded our expectations, as did the enthusiasm and joy of the guides. We will definitely recommend the Moab Adventure Center!! Jace was so much fun as our guide on the Colorado River PM Half Day Trip. He is perfect for his position… Informative about the area, down to the rocks we saw on our raft trip. You have a wonderful employee in him. He deserves a huge atta-boy. Lunch was fabulous. Hurray for the Moab Adventure Center!! We are already recommending your business on Facebook with all our pictures.